This is the second book from the series ‘Tarot Decoded’ by Ella Jo Street. 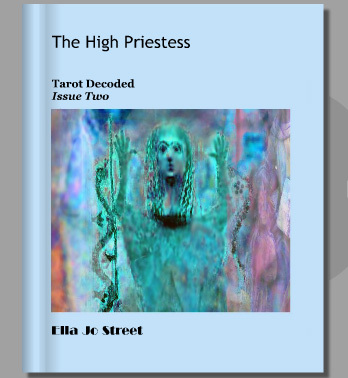 In her analysis of the The High Priestess card, she traces this tantalizing figure from her ancient roots to modern times, revealing the Great Goddess. This collection of fascinating essays explores the mythology and psychology associated with the worship of the Nature and Wisdom Goddess, making this book invaluable for understanding the development of witchcraft and emergence of the Wiccan Religion. Also containing an extensive collection of ancient images, this book contains material for Tarot training and is a valuable Pagan source-book.